The silver Mercedes train marches on, but the first grand prix of the 2016 Formula 1 season will be remembered as one that Ferrari threw away. The podium in Melbourne had a very familiar feel - a Mercedes one-two, with Nico Rosberg leading Lewis Hamilton home after the world champion made a poor start, and Ferrari's Sebastian Vettel third - but it was a race Ferrari let slip through their fingers. 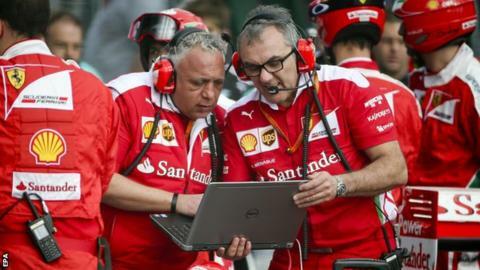 Ferrari team principal Maurizio Arrivabene was asked directly whether he viewed it as a race the team had lost through their own decisions, and he said: "No." Others were less charitable. "They messed it up," said a senior figure from a rival team. After a flying start, Vettel was leading the race until it was stopped after 18 laps following a terrifying accident from which McLaren's Fernando Alonso mercifully emerged unhurt despite barrel-rolling following a 180mph impact with Esteban Gutierrez's Haas. Vettel had only recently stopped to fit a fresh set of super-soft tyres and Ferrari chose to remain on them, knowing there was no hope of making it to the end of the race and that the German would have to make an extra stop. Mercedes took a different route, one that one engineer said was "a no-brainer". Hamilton, stuck in traffic after a bad start, had already been put on mediums at his stop with the aim of going to the end of the race on them. The red flag gave Mercedes strategists, led by James Vowles, the chance to put Rosberg on the same strategy. It was borderline, but they were confident they could make it work. Sure enough, Rosberg lost almost no time in the 17 laps before Vettel's final pit stop and when the Ferrari peeled into the pits, the race was in the bag. In one decision, Ferrari had turned a victory into a third place. Vettel came back at Hamilton in the closing laps but passing was always going to be difficult on this track and it became impossible when he spun with two laps to go. The Ferrari party line was clear after the race. "If you want to look at the glass not half-empty," Arrivabene said. "We were there [with Mercedes]. This is the news." Arrivabene did have a point, though. "The pace in the race was very good," he said. "We need to continue to push because every race has its own story." After qualifying, it would have been easy to jump to the conclusion that the pre-season indications that Ferrari had reduced their deficit to Mercedes were wrong - Hamilton was 0.8 seconds up the road from Vettel and there was an all-Mercedes front row. But there were extenuating circumstances. Ferrari had chosen to do only one run on the softest tyres in the final part of the controversial new qualifying format, preferring to keep a new set of super-softs for the race. It was a fateful call, as it seems to have influenced their thinking on strategy, as we have seen. But it also influenced the final gaps, because both Mercedes drivers did a second run, and both improved. Before that, Vettel was only 0.5secs behind Hamilton - which is twice as close as he was in Australia last year. Equally, the cool conditions of Saturday are ones in which Ferrari have tended to be weak in recent years - the car struggles to heat up its tyres. As indeed happened again in Melbourne. Vettel said that Ferrari had "had a bit of rough session". Team-mate Kimi Raikkonen added: "People get all crazy because the qualifying lap time difference was quite big but it was very odd circumstances and conditions. "I don't think the time difference you saw at the end of qualifying is true. They did an extra run compared to us and the conditions were pretty cold so we struggled a bit with the [tyre] warm-up. "We knew we would be pretty OK after [pre-season] testing and today it seems to be more normal with the hotter conditions." Ferrari were indeed stronger in the race, but the circumstances of the strategy made it difficult to make a definitive call on just how close to Mercedes they really were. Rosberg sat right behind Raikkonen in the first stint, clearly very comfortably able to keep pace. After the re-start, with Vettel on super-softs with only four laps on them and Rosberg on mediums he had to make last for 38 laps, the Ferrari pulled out 3.9secs in seven laps before the Mercedes started to come back at him. It's hard to be completely definitive about what that says about the relative pace of the two cars, but it does suggest that the Mercedes is still the quicker car - but certainly by no more than 0.2-0.5secs a lap. In other words, after the first race of the year, the picture looks very similar to that after testing - Ferrari are not "there" yet, but they are close enough to cause some trouble. "Hopefully," Hamilton said, "we have some exciting races coming up ahead of us." It is notoriously hard to get 11 team bosses to agree on anything in F1 - which is partly why the sport finds it difficult to make rule changes. So it is a mark of just how bad the new elimination qualifying format was deemed to be that, only 18 hours after it first took place, a unanimous agreement for change is exactly what happened. An emergency meeting was held on Sunday morning to discuss what to do after the final four minutes of qualifying ticked by with no cars on the track and all the teams and governing body the FIA agreed to revert to last year's system for the next race in Bahrain on 1-3 April. According to Mercedes F1 boss Toto Wolff, the sport's commercial supremo Bernie Ecclestone has also agreed. That means the decision should pass smoothly through the next stages of the legislative process, even if Pirelli - which has a vote in a decision that needs to be unanimous at the F1 Commission - did throw in a curveball after the race. Its motorsport boss Paul Hembery said he "hadn't heard all the arguments", adding: "Most people would just like to understand what we are trying to achieve. Going from one to the other so quickly needs explanation." Many F1 insiders were amused to read Ecclestone's comments on Saturday following the unanimously negative reaction, saying he had never wanted the new system. In fact, it was solely down to the 85-year-old that any change was made. He was determined to make a change to qualifying in an attempt to make races less predictable and he told the teams that they had two choices: either they could accept some kind of reverse-grid system for the top cars; or the knock-out format that was eventually agreed. As Wolff put it, without naming Ecclestone: "Two proposals were on the table. One was reverse grid and the other was that one; we voted for the least worst." Former world champion Niki Lauda called the new qualifying format "the worst decision in F1"
Not everyone, though, feels that going back is the right decision in the long term. Hamilton pointed out that "we made a change because it wasn't good enough". And Wolff said that at least one other driver had seen some positives in the new system. "Lewis' opinion is interesting," Wolff said, "and Max Verstappen said the same - it is quite a challenge to be out there, you need to perform. You can't really let go because you could be out. So some drivers liked the challenge. "It is an exciting format, a shoot-out, as long as you are capable of transmitting that in the right way on the television. The spectator needs to be able to follow, and the feedback we had from the guys watching it is that was very difficult. And about Q3 we all have the same opinion - it is rubbish." But Wolff also made another very prescient point. "This is a global sport," he said, "and we have to acknowledge we have a responsibility and changing the rules every week is not the right way forward. "There are for sure ways of optimising qualifying and maybe even the race. But what we need is to properly assess what is right and wrong and not have erratic decision-making."